A jam is many things. It’s fun. Loose. Liberating. Social. 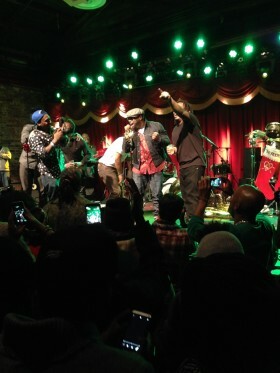 But it’s also a chance to just make some music, no questions asked, and that was the prevailing vibe Monday as the Roots played the seventh annual Okayplayer Holiday Jam at Brooklyn Bowl. Okayplayer is a hip-hop website brought to life by Roots drummer Questlove in 1999. Its yearly invitation-only holiday event is notorious for drawing serious, unannounced talent (the only act advertised ahead of time is the Roots).